Looking for a complete protection package for your computer which includes security features like Antivirus, Firewall, Tune-up, AntiSpam, Chat & File Encryption, File Shredder and Performance Optimizer then, BitDefender Total Security 2011 brings you the ultimate experience. It is build with creative featured Advanced Security PLUS PC Optimization. BitDefender Total Security is an amazing PC tool which protects your system from latest viruses, spyware, phishing and identity-theft attacks. Its a strong PC protection software competing with best internet security tools available in the market. First of all, BitDefender's Installation will detect any other security programs you have installed and leaves an option for you to uninstall them. BitDefender may nor function properly if they are not uninstalled. It has a basic setup which takes 4-5 minutes and has customizable option for deeper control of features. 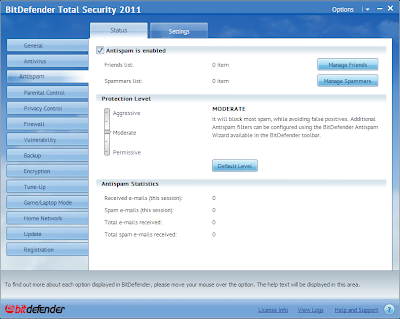 BitDefender Total Security 2011 has three different Interface views - Basic, Intermediate and Expert(can be changes during Installation). You can switch to these views whenever you want. Basic(Restrictive) - Accessing features not shown by Default. Intermediate(Complex) - Configurable Tools and Quick Access to most commonly used features. Expert(Useful and Advanced) - Easy to find the security category you are looking for. Antivirus, Anti-Malware Detection, Phishing protection, Spam Guard, Chat Encryption, Firewall, Performance Optimizer, File Encryption and Online Backup. Intelligent Multiple and Deep Scanning. Search Advisor, warns you when opening malicious Web sites. Enhanced Parental Controls to monitor child's activity. Advanced Security PLUS PC Optimization. Installation consumes more time about 4 minutes and 23 seconds. Doesn't impact on System's Shutdown time which is very impressive. BitDefender gives you 24x7 professional technical support. 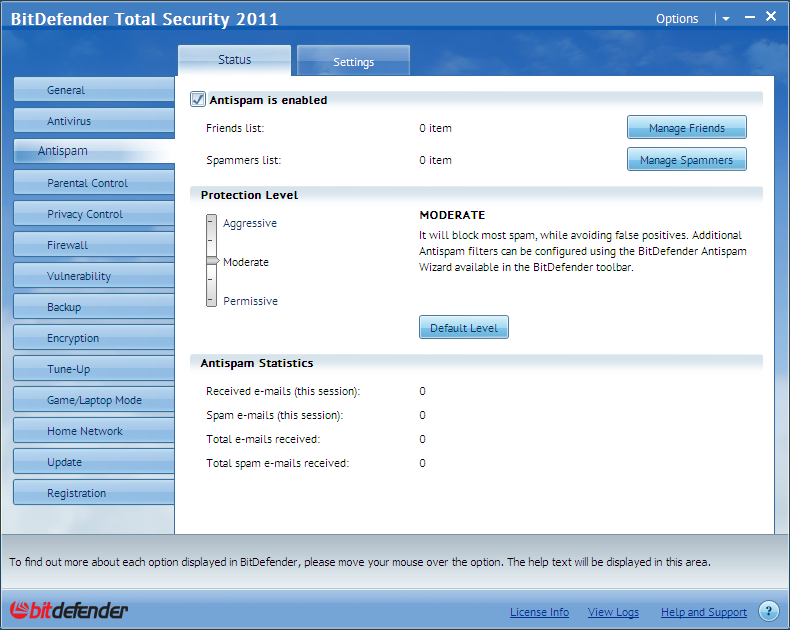 Download BitDefender Total Security 2011 30-day Trial Version for free or get it for $44.99.